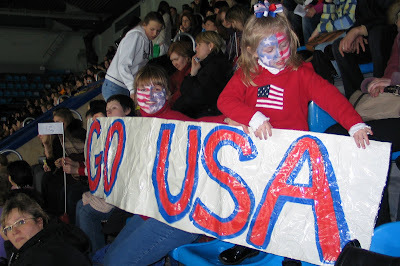 American Girls in Moscow: Headed to World's! People in Moscow are very grateful, however, for the chance to attend the competition and cheer on everyone... Because of the short notice, it wasn't that hard to get some good tickets. The four of us are going with friends to watch the ladies' freestyle (medal-deciding) competition next Saturday, and then on Sunday Katya and I are joining another mom and daughter from her class to go to the Exhibitions. But we WILL bring big banners for the Alissa Czisny and Rachel Flatt! Alissa was a Russian major in college; she must be so excited about the unexpected trip to Moscow! Hope you had a wonderful time. I've never attended an event like that and think it would be so much fun.